We believe in adding business value by beautiful delivery. That’s why we choose to deliver a Minimum Lovable Product (MLP) instead of a Minimum Viable Product (MVP) in our innovation projects. It started with research in shaping our end-to-end blockchain services. We kept a couple of things top of mind. Gather insights in the true needs of your customer was an important one. And ask feedback early as possible. Essentially, just treat it as innovation of course. So I talked to quite a few of our customers and the idea grew in my mind. I would just draw it out on the fly for them, in it’s then current state. And it improved after nearly everyone I talked to. When the learning curve flattened, we solidified it in a 1.0 version and asked one if our designers to make it beautiful. Because beauty matters, it moves us, it makes us happy. Think of a great work of art or piece of music, it touches the heart. And that’s exactly what we want for our services, not only to be the answer to what’s really keeping our customers awake at night. But also to be truly appealing to them. The idea of thinking big and starting small is broadly recognized by now as a good way to build a product. First come up with a great concept that is viable, feasible and desirable. Keep the long term goal in mind whilst also gathering feedback for further development as early as possible. But there’s a shift in what ‘starting small’ should be. And let’s be honest, how appealing is an MVP? Well, what can you say about it. It’s alive. It works. Of course it works, we’re a tech company. But does it move you? Do you really want to have it? To work with it? Meh. Let’s start with a couple of definitions. Eric Ries’ definition of a Minimum Viable Product is “that version of a new product which allows a team to collect the maximum amount of validated learning about customers with the least effort.” It is meant to rapidly test what the product’s most important features are to bring business value to the intended users. Furr and Dyer even suggest changing terminology from “Product” to “Prototype”, just to stress that it does not need to be an actual product in order to reach its goal. It could just as well be a dummy, mock-up, cut and paste cardboard, or combination of a coat hanger, sheet protector, pico projector and netbook (google glass’s first prototype). That’s why after answering the crucial questions on viability, feasibility and desirability of a concept together, we don’t build an MVP. We build a Minimum Lovable Product (MLP). The MLP has the client’s top couple of features and is beautifully designed. It is appealing. In addition to working great technically, of course. Now this concept of the MLP fits not only in the first steps of blockchain concepts, of course. The MLP is valuable for every innovation project we do. So we incorporated it in our Thinkubator model. We use our Thinkubator model to help our clients realize a business prototype with a new technology. This prototype delivers value by using our proven process, technology expertise and accelerators, and the client’s knowledge of their own business. What’s different in an MLP? A Minimum Lovable Product (MLP), or Minimum Awesome Product as Intuit’s founder Scott Cook calls it, is intended “to deliver a solution that is so extraordinary on the most important dimension that it inspires positive emotion in your customers.” So, the MVP helps gain insight on what the most important features actually are. The MLP on the other hand is a highly focused exercise intended to make a small number of users passionate about the product. And a small number in this stage is enough. Especially with new technologies, not everybody will adopt it at the same rate. As Sam Altman stated, “it’s better to build something that a small number of users love, than a large number of users like.” If this small number, this tribe, is passionate about it, a group of advocates is born and will help it fly. This image of Y Combinator illustrates that nicely. 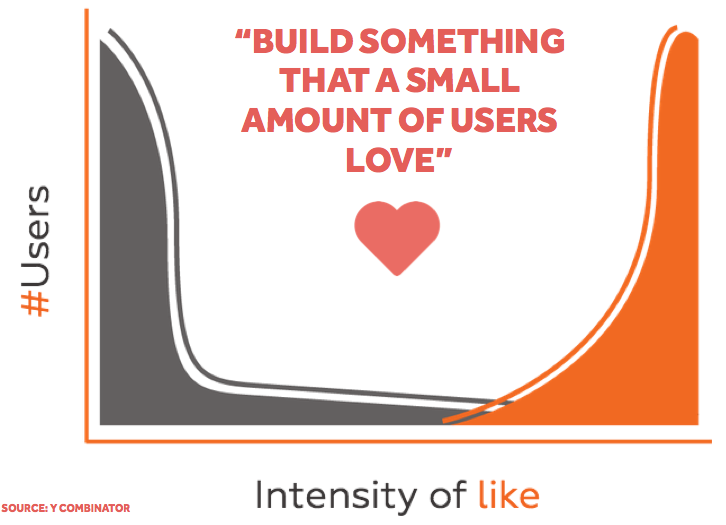 Low intensity of like for a large user group will end in medium to high intensity of like for a small number. Whereas medium to high intensity of like at the start will end up in high intensity for a large number of users. So what we do, is identify a concept in the field of a new technology like blockchain, that is feasible, viable and desirable for the specific client. In the desirability phase we build a mock prototype. This works for the end user, it does what it’s intended to do. However, there is no technically working product behind it. We interview the client and clients’ client in order to learn as much as we can about the most important features. Then we move on to the Minimum Lovable Product. A product, technically working but much more important: containing only top features and great design to wow our client.